I understand the nostalgia pull as Carlyle coached the Ducks to their first Stanley Cup championship a decade ago and won a bunch of games during his six-plus years with the team but this is not a good hire. First off, the Ducks fell apart in Carlyle's last season, leading to him getting canned 24 games into the 2011-12 season and then he failed in Toronto, leading to him getting canned 40 games into the 2014-15 season. Should nostalgia for the good ol' days take precedence over finding a good coach? It didn't work out all that well in Gulutzan's first go-around as a head coach as he lasted only two seasons with the Dallas Stars a few years back and failed to make the playoffs either year but he should be a decent fit here with the Flames. He's the opposite of former coach Bob Hartley in terms of coaching style and that's not a bad thing considering that Hartley's grind-em-out style resulting in one playoff berth in four years. Gulutzan is considered to be cerebral and an outside-the-box thinker and I think that will fit well with this club, especially if he cranks up the puck posssesion numbers. The rap on Boudreau is pretty clear at this point. He is a terrific regular season coach, proven by the fact that he has won over 65% of his games during his time in Washington and in Anaheim. However the reason why his front offices grew tired of him and ultimately canned him was that he didn't get it done in the Stanley Cup Playoffs, having only made the Conference Finals once. For a team that seems to consistently need to press late to get into the postseason and hasn't won a division title in a decade, plus a team that has struggled to score, Boudreau is a good fit. After getting passed over by Boudreau, the Senators moved quickly to their next option and that was Boucher who was last spotted coached SC Bern over in Switzerland. He hasn't coached in the NHL in three years after his flamed burned out quickly in Tampa Bay after reaching the Conference Finals in his first season in town. His 1-3-1 system worked wonders when teams weren't able to crack it (and Mike Milbury loved it) but teams did eventually figure it out around when his players began to tune him out. 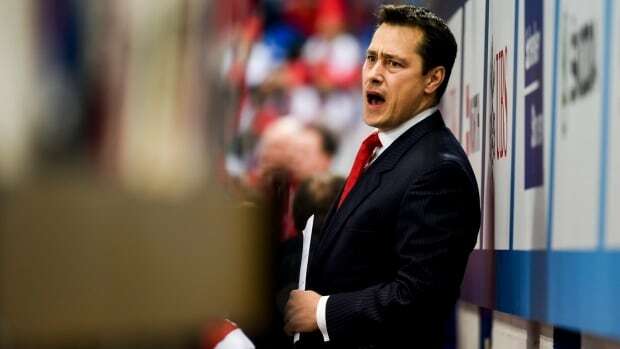 I think Boucher can coach but he definitely has something to prove.